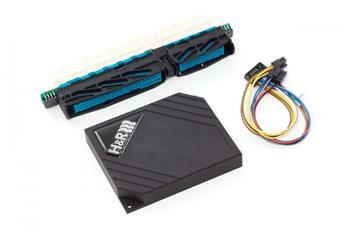 H&R ETS Electronic Lowering Systems are designed for cars with factory air suspension. H&R ETS work with factory air suspension to easily lower the chassis up to an additional 40 mm more from the factory setting. Lowering with H&R ETS enhances the look of your vehicle with a reduced fender well gap, and improves handling with a lower center of gravity. H&R ETS retains the factory height adjustment switch and its functionality. All H&R ETS modules are plug-and-play, with no wire cutting and splicing or mechanical wrenching necessary. This means that no modifications to your factory wire harness are required and that the module looks like a factory installation. H&R ETS modules come with all the parts required for installation. The ETS unit is easily removed whenever you want to return your car back to factory specification.